Flower petal shapes from painted paper copy the background of this sunny photo from Krylon. Cut three sheets of 5" × 7" glossy paper and spray each with the following colors: A) with yellow only, B) with a combination of mostly yellow and a touch of red, and C) with a combination of yellow and blue. Set all aside to dry. Trim down light green cardstock and embellish edges with green stamp ink; mat onto yellow cardstock to create background. Tear strip of plaid paper and create border as shown. 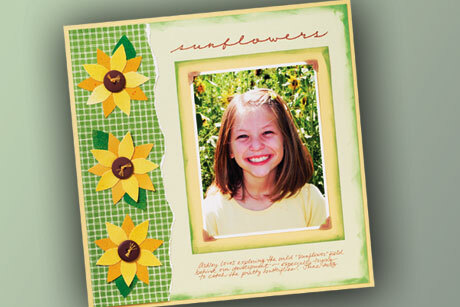 With kraft photo corners, mat photo onto yellow cardstock that has been shaded with green stamp ink around edges. Cut 15 petals each from the painted yellow and yellow/red combination sheets with Coluzzle. Cut four leaves from blue/yellow sheet. Arrange shapes into three sunflowers on plaid border strip and adhere. Add buttons in centers with floss ties to complete design. Add title and journaling to complete layout as shown.